Then my senses exploded, I went into shock, endorphins flooded my system and away I went stumbling towards my colleagues waving it in the air. A haul of Viking treasure has been unearthed from a field in south west Scotland by an amateur using a metal detector. Derek McLennan, a retired businessman from Ayrshire, made the find in Dumfriesshire in September. 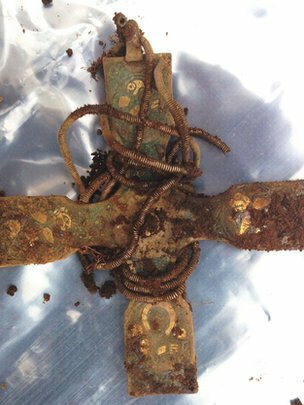 In total, more than 100 items were recovered, including armbands, a cross and brooches. Experts have said the discovery is one of the most important Viking hoards ever found in Scotland. The items are believed to be worth a six-figure sum. Mr McLennan last year uncovered Scotland's biggest haul of medieval silver coins. Among the objects within the hoard is an early Christian cross thought to date from the 9th or 10th Century. The solid silver cross has enamelled decorations which experts consider to be highly unusual. The haul also includes possibly the largest silver Carolingian pot ever discovered, with its lid still in place. 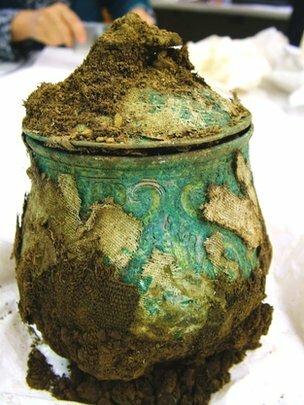 The pot is likely to have been around 100 years old when the hoard was buried in the mid 9th or 10th Centuries. Stuart Campbell, National Museum of Scotland's head of Scotland's treasure trove unit, said: "This is a hugely significant find, nothing like this has been found in Scotland before in terms of the range of material this hoard represents. "There's material from Ireland, from Scandinavia, from various places in central Europe and perhaps ranging over a couple of centuries. "So this has taken some effort for individuals to collect together." Mr McLennan said he had dragged himself out of his sick bed to pursue his passion for metal detecting on the day he found the Viking treasure. He had been given permission to search the site and after an hour he found a silver object, at first he thought it was a spoon but when he rubbed the surface he recognised the Viking decoration. Further excavation unearthed more than a hundred items of silver and gold including a bird pen, metal vessel, armbands, cross and brooches. Experts say it's one of the most significant Viking hoards ever found in Scotland. He said: "I dragged myself out of my sick bed because I had two friends that wanted to detect and I'm a bit of an obsessive. "I unearthed the first piece, initially I didn't understand what I had found because I thought it was a silver spoon and then I turned it over and wiped my thumb across it and I saw the Saltire-type of design and knew instantly it was Viking. "Then my senses exploded, I went into shock, endorphins flooded my system and away I went stumbling towards my colleagues waving it in the air." Fiona Hyslop, Cabinet Secretary for Culture and External Affairs said: "The Vikings were well known for having raided these shores in the past, but today we can appreciate what they have left behind, with this wonderful addition to Scotland's cultural heritage. "It's clear that these artefacts are of great value in themselves, but their greatest value will be in what they can contribute to our understanding of life in early medieval Scotland, and what they tell us about the interaction between the different peoples in these islands at that time. "The Dumfries hoard opens a fascinating window on a formative period in the story of Scotland and just goes to show how important our archaeological heritage in Scotland continues to be." "As ever, the Scottish government will work to facilitate and support the discovery, analysis and exhibiting of finds like this, for the benefit of people here and abroad. "With that in mind I would like to echo the praise for the responsible behaviour of the metal detectorists: without their continued cooperation this would not be possible." Look how fortunate McLennan is. A retired businessman like him knows where to find buried Viking artifacts in his homeland.